“The Cosmic Egg,” an incandescent show at Ridge Street Gallery, December 3 through January 22, 1993, glows in the dark. This thoughtful and celebratory exhibit offers art-as-mythos: a visionary guide to entering and navigating the third millennium successfully. Shaman-like, it attests to what is true, what is important, at a time of great world change. With burnished clarity, “The Cosmic Egg” delivers three transformed myths: Divine Sparks: A New Creation Myth, Under The Arbor: A New Adam And Eve Myth, and Thou Shalls: A New Ten Commandments by Imogene Drummond. In this prodigious exhibit of myths as books, paper cut-outs, and performances, Drummond’s symbolic language, both visual and written, crystallizes into poetry. 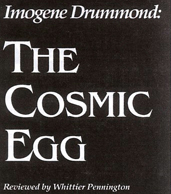 One wonders if Crete, where Drummond lived while creating “The Cosmic Egg,” swayed her to embrace the role of world regeneratrix with such abandon and glee. Did the mystical Minoan landscape affect her ornate and luscious imagery? How? The land of Athena, the Minotaur, and Ariadne clearly was a fitting place to recreate the world, the first couple, and ten renewed commandments. Divine Sparks, Under the Arbor, and Thou Shalls are guides to a metamorphosed spirit of empowered wholeness. Hierarchical power of monotheism, patriarchy, abuse and violence are dealt with bull-leaping finesse, and deftly turned to positive empowerment. The first “Thou Shall” is “Honor and Nurture the Divine Spark in Yourself.” God, for Drummond, is neither male, nor white, nor above. These mythical poems are written in the voice of the child triumphing in the wilderness. Written for children, for adult children, and for the child in us all, these transformed archetypal myths summon a renewed world. They celebrate diversity, and are imbued with honor and love of nature: a concept including oneself and others as a divine/living interconnected whole. The paper cut-outs highlight the joie de vivre of these myths. They are spiritual and sexual, childlike and mythic. These twenty-three works shimmer and resonate with colors and shapes that blast the viewer with notes of spicy pleasure. These pieces hop, twitch, hoot, and sing of a joy that embraces the multiverse. Spirals, leaves, moons, and waves repeatedly spin and twirl in these works, while transforming themselves into dancers, trumpeters, birds, coral, and fish in the eyes of the viewer. Flat planes of color entice the viewer into and through seemingly infinite planes of space — in an Alice in Wonderland/Star Trek sensation. An artistic descendant of Matisse, Drummond takes her creativity further: into areas of symbolism and mythology. She explores the archetypal egg. This central motif provides a point of stability. 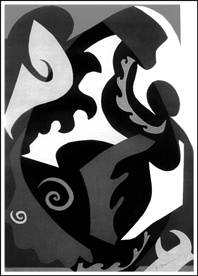 Yet, the singularity of each cut-out demonstrates the endless possibilities that emerge when one taps into creative flow. These organic works, like verdant gardens, are born of fertile soil; yet like shooting stars, they reach cross ecstatic heights. Under the Arbor was read by New York stage, film, and T.V. actress Laura Delano on December 18 with juicy verve. Her spritely magnetic performance induced the audience to see the poetry and hear the artwork. Delano plans to take “The Cosmic Egg” on tour. Drummond addresses the educational aspect of art in a gallery alcove information shrine offering background materials related to her work. Books that directly influenced Drummond’s art, symbolic photographs by the artist of the Cretan environs that influenced her, an artist’s statement, comments by poet Ulka Keith, and a notice of travel plans for “The Cosmic Egg” are shared. 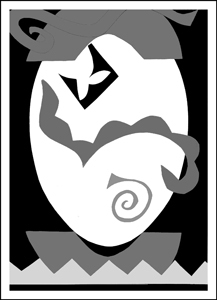 “The Cosmic Egg” offers life-affirming art for cultural transformation: It delivers joy. In addition to writing art reviews for various publications, Whittier Pennington has been involved in areas of the arts such as regional theater and dance, and has also been a business consultant.